Papergreat: Does anyone still own a 1-square-inch Texas ranch? Did anyone ever do this and send their two dollars??? Two dollars doesn't sound like much, and I know it partially covers postage and handling, but let's just say that this Texas land was very overpriced. Math is your friend, in this regard. One acre of land contains about 6.2 million square inches, so you are paying at the exorbitant rate of about $12.4 million per acre. For land with, presumably, no structures or utilities. The average Texas ranch covers about 500 acres, so if you paid for one at the per-square-inch rate offered in this advertisement, you'd be paying $6.2 billion. Not even the Ewing family had that kind of money in the late 1970s. Here's a link to a Flickr page that appears to show one of the deeds you would have received for your $2. It indicates the land is in Potter County, Texas. 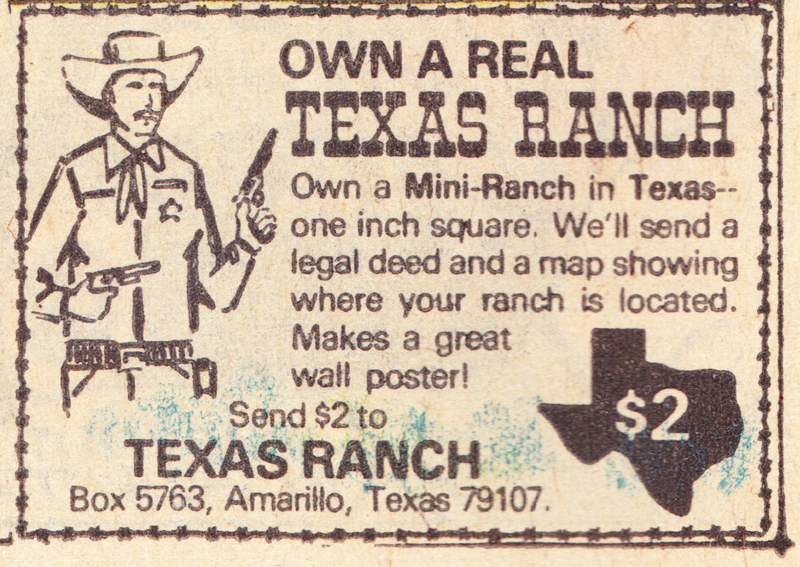 Final note: Your Mini-Ranch would be SMALLER than this advertisement, which measures 1⅞ inches wide by 1¼ inches tall.